I was tagged to a list of Quranic verses posted on Facebook from an insular friend, who is intelligent enough to find the truth, but regularly chooses to throw things to excite his ilk and rattle a few Muslims. In the last twenty years, I have explained this over and over again, and every year, I welcome several new friends and repeat the process. My friends have never read the verses but quote them, if only they check the Quran, they will find out, that these verses are not there as written. Thank God, the people who seek the truth got themselves free, and those who have no desire to know the truth, continue to harbor ill-will towards others and live in pain and misery. You cannot be at peace if you are always at someone’s throats. I have done a few workshops on the Quran, and it is a book of guidance to create cohesive societies. I will be happy to present a seminar in your town if you pay for the air and hotel, I will pass up the honorarium and also offer you the steps to find the truth on your own, that is the best way! Quran 47:4 “Do not hanker for peace with the infidels; behead them when you catch them.” What are we teaching our kids? Does this sound bad? If you read the full judgment and reason for such a sentence, you will understand it, and it was not the whim of one person on the spur of the moment, the decision was made after many deliberations. Of course, we need to be more civilized and cut the death penalty out and rehab the criminals. A hundred years ago, all societies carried public executions, and sometimes they killed by beating them to death. In the late 19th century, 40,000 people showed up to lynch a black man in Waco, Texas. The largest gathering to watch this wretched act. Your society is not free from it either. 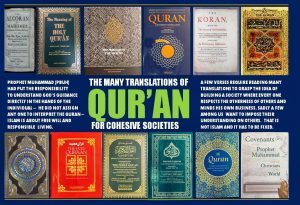 Back to the Verses – Of the 55 plus Quran translations available in English today, three of them are evil translations designed to foster ill-will between Muslims and all others, it was done by both Christian Kings and Muslim men in the year 1143 AD and 1924 AD respectively. If you are a truth seeker and want to be free from anxieties, you will find the truth. It is easy, look up the book. I am here to guide you the first step, and if you graduate, I will take you to the second and third step. As a pluralist, that is someone who respects all faiths equally for the good they do to their followers along with regret for the people who don’t get it. I am a Muslim today because I accidentally found a verse in Bhagavad Gita that changed my life; Its wisdom was, finding the truth is your responsibility. You must have read Bhagavad Gita, why don’t you get it right? Quran is the same; if you have a problem with Muslims, you see issues with your foggy mind. If your parents, friends, teachers and clergy and bloody politicians have poisoned you with the bias towards others, it is time to jettison their crap and be free. Here is a suggestion to understand the above verses. Read three sentences before and three after the given verse. Go to the website https://www.islamicity.org/quransearch/ and plug in (9:2-9:8) at that is a total of seven sentences to understand verse 9:5, and do the same for all the verses above. If you get that right and find freedom, spread the word to the source, you got the list om. If you don’t get this right, you have a right to believe and live with ill-will toward Muslims, Islam and the Quran. However, if you want to free yourselves from Ill-will, you can find the truth and enjoy a fearless tensionless life. I will be happy to hear you out after you have put in the effort. If you are serious about knowing more about Islam, Allah, Quran, and the Prophet, read my book- it gives you a step by step analysis to such verses, the book is called American Muslim Agenda, and it is available at Amazon. Dr. Mike Ghouse is committed to building cohesive societies and offers pluralistic solutions on issues of the day. His book, the “American Muslim Agenda” is about Muslim earning their respectable space in the community be it social, religious, cultural or political. The book is available at Xlibris, Amazon, Barnes and Noble and Kindle. Mike’s mission is to open people’s hearts, minds, and souls towards each other. He believes that the ultimate purpose of humans is to live freely and be comfortable with their culture, race, religion, ethnicity, sexuality, and individuality.